Don McDonald flew the big radial-engined skytrucks in the late nineteen seventies and early eighties, but found the career outlook to be less than favourable given the global economic situation in those days. He 'retired' from aviation in 1983, a very difficult decision for him to make. Don still treasures the memories though: these 'propliners' took him far and wide bringing many an adventure, meeting interesting people and cultures along the way. Here he has written some of his memories of people and events during his days of flying the big radials. 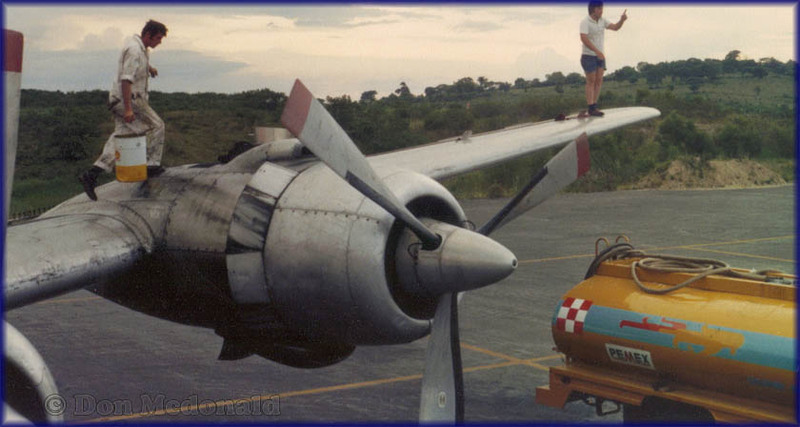 We had tanker bases in Merida, Campeche, Ciudad del Carmen, Poza Rica, Veracruz, Tampico, Minatitlán/Coatzacoalcos, Reynosa and Matamoros. I spent most of my time operating out of Poza Rica and Ciudad del Carmen. These photographs were taken while I was working out of Poza Rica. On approach to Minatitlan, Veracruz, during the last week of October 1979. Yours truly driving Tanker 444 C-GHCA. I remember the crappy weather that week, the peak of the hurricane season that year. I probably should have had my eyes forward at that altitude (duh!). Note the tank valve / spray control panel on the forward bulkhead. We had a bird-dog plane to guide us to the day's working area, but then we were on our own. 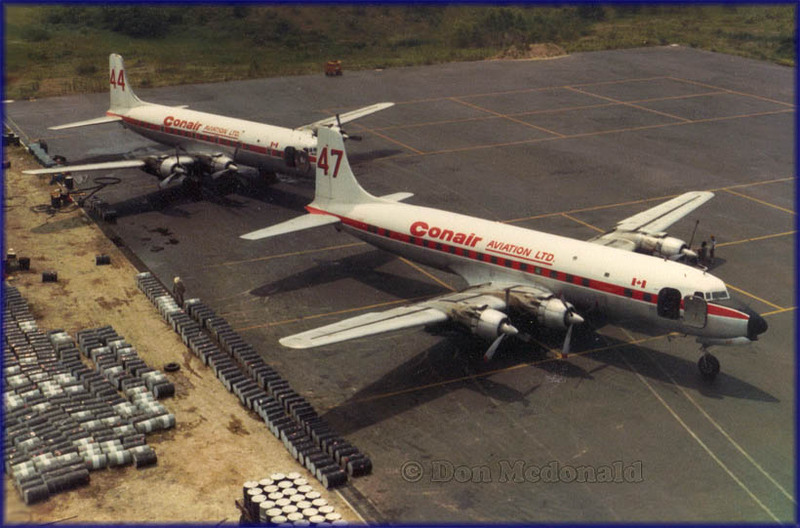 Poza Rica, Veracruz, August 1979 (taken from the control tower): Douglas DC-6B Tanker 444 C-GHCA & DC-6B Tanker 447 C-GICD. 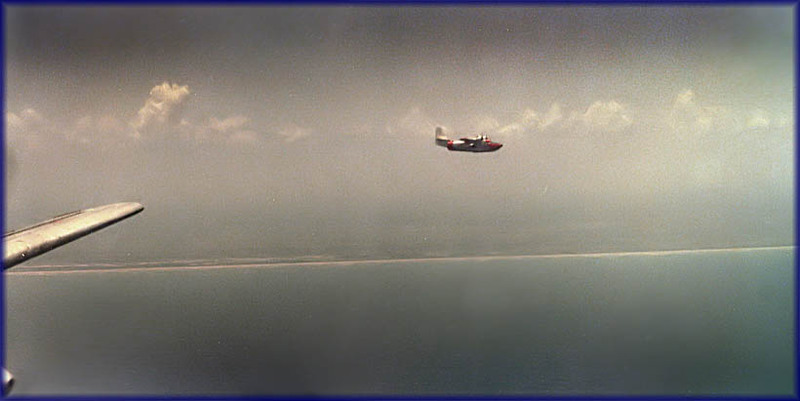 It was challenging work, hot and dangerous as we had to execute precise spray patterns at 50 feet above the water so functioning dual radar altimeters were part of the go/no-go checklist. The first few runs were always the most stressful since we were at gross weight with a sea-level temperature typically between 35 and 40 Celsius so performance was a bit of an issue and at 50 feet you are in serious ground-effect. The other thing to keep in mind is that the DC-6 has a wingspan of about 120 feet/36 meters, so pulling a turn at the end of a spray run at 50 feet may not be a good idea. So the drill at the end of a spray run (after reaching the gps waypoint) was to continue on the existing heading then call 'booms off' (i.e stop spraying), 'climb power', 'flaps 15', 'call 300 feet, '300 feet'....., then make the turn for the next run. DC-6B C-GHCA (c/n 45197/753) made its last flight Edmonton-Abbotsford on 24sep93; TAT 36.398,9hrs. It was used for parts supply, the tailsection ended up on N861TA of Woods Air Fuel in Alaska. DC-6B C-GICD (c/n 45496/992) became N151 for Everts Air Fuel in 1996, also in Alaska (see a photo on Photos by Friends & Guests page 11); note- this was the 2nd DC-6 to become N151 for Everts, the 1st had crashed on 03Mar92. Poza Rica, Veracruz - September 1979. The usual end-of-day routine: oil-up and fuel-up. AME Mike Gilderson with the oil-pail, FO Brock Van Doormaal directing the fuel truck. Depending on the crew mix, we’d all work together to get back to our hotel faster. Some crews let the junior guy (me!) do it all. Not these guys. Ciudad del Carmen and Poza Rica were our two biggest bases of operation. 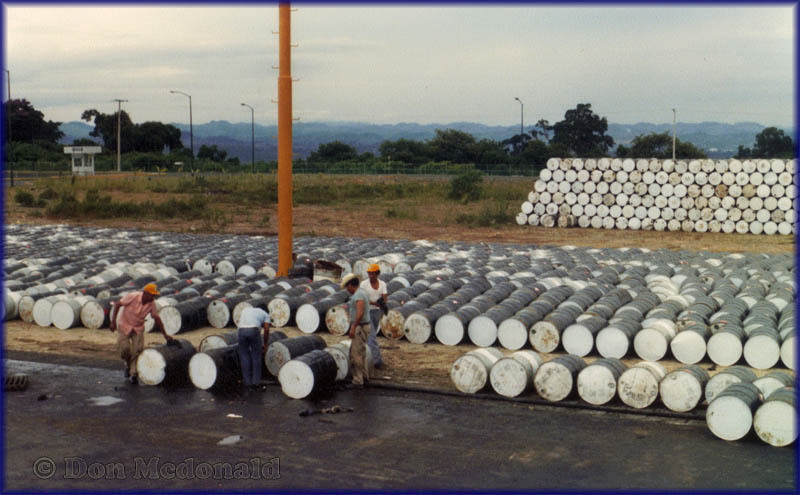 This is a shot of the barrels of chemical dispersant we loaded up with. We referred to it as 'goop' and we had our 'gooper' crew as shown in this photo. 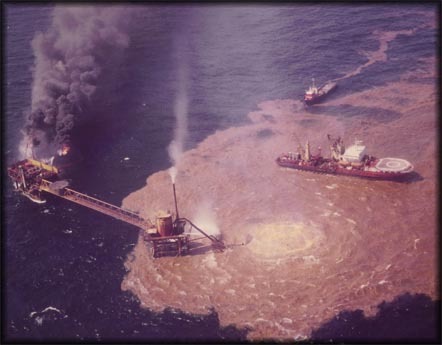 The stuff was barged from Houston across the Gulf of Mexico, then trucked to the various bases we operated from. These guys worked their asses off, unloading and moving barrels, then dumping them into the fill-up trough (the barely visible channel at the edge of the tarmac), then helping me with the pumps and hoses to load the airplane. 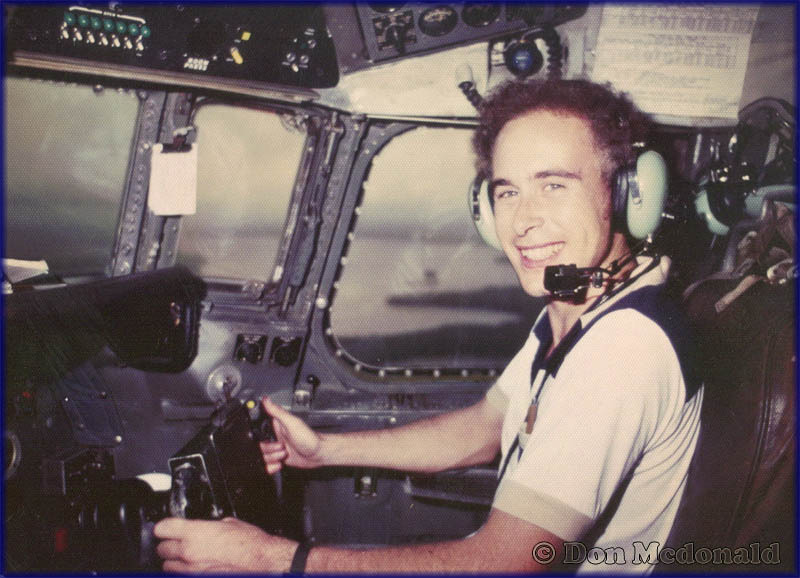 I was Second Officer (SO, and occasionally FO) on Tanker 447 C-GICD. 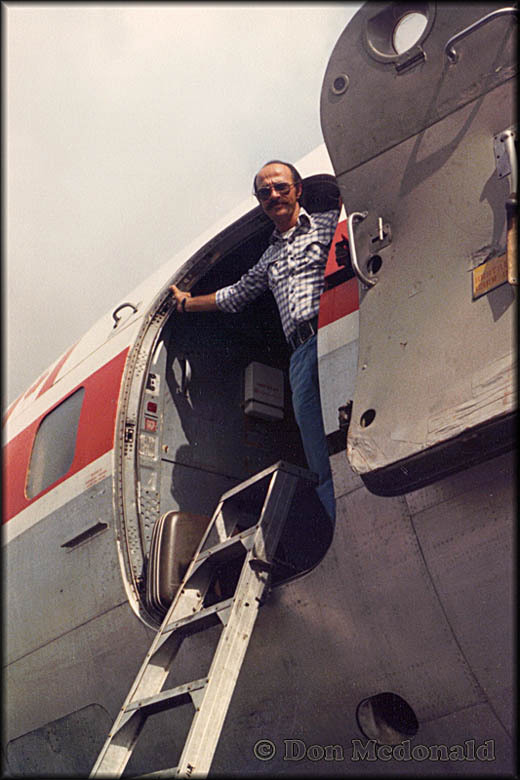 Captain was Alexander Linkewich (who later changed his name to Linc Alexander; Linc also wrote The Book on aerial firefighting, titled Air Attack On Forest Fires / Friesen, 1972). The FO was Brock Van Doormaal. Tanker 447 was sent back to Canada on a three-engine ferry flight. I’m reasonably certain that Ted Mitchell was captain on this ferry flight, the FO may have been Bjarne Juthans. Other DC-6 crew I flew with were captains Boyd Cooper, Jim Petrie and Ted Mitchell. FO’s were Bjarne Juthans, Rod Boles and Doug Spence. In December I was assigned to Tanker 445 C-GHLZ, with Al Linkewich (a.k.a. Linc Alexander) and Bjarne Juthans. Great guys, all of them. Best crews I ever worked with and they taught me a lot! Poza Rica, Veracruz - September 8 or 11th, 1979. 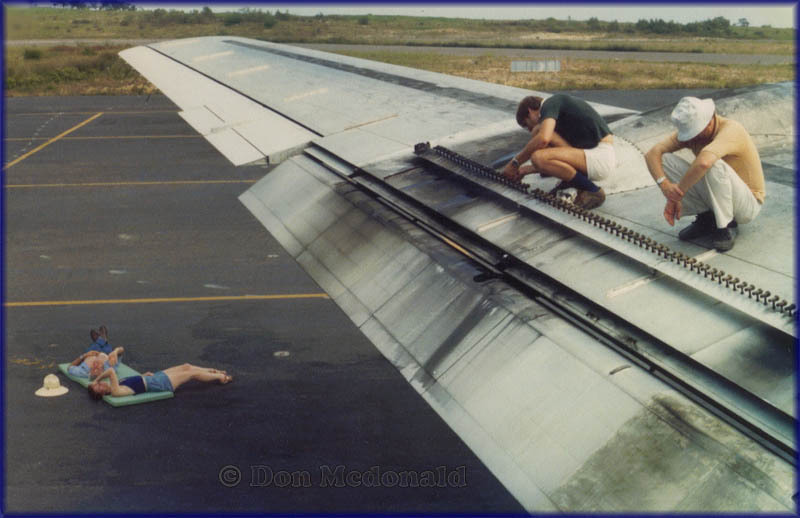 Captain Boyd Cooper and his wife Bonnie are lying on the tarmac, waiting for us to fix the spray booms. Boyd is actually a dentist in Victoria, BC and was filling in due to a shortage of pilots those days! On the wing, George Mutz (chief mechanic, who is unfortunately no longer with us) and Rod Boles, FO. thinking of something really, really rude! Refer back to the photo above on which you can see all the barrels of ‘goop’ lined up. 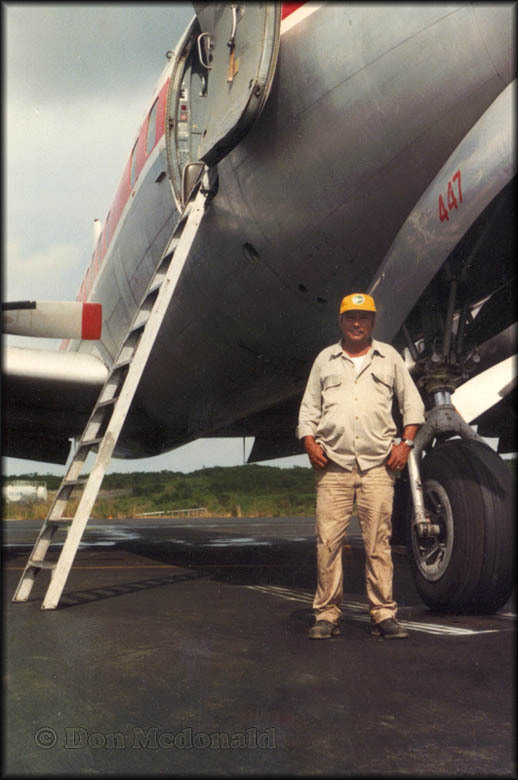 They were opened by our Mexican ground-crew and dumped intro a trough at the edge of the ramp, under the wing of Tanker 444, then pumped from there into the internal aircraft tanks which was my job to supervise. (SO’s get to do all the cool stuff: loading, oiling, fueling, cleaning the cockpit, emptying ashtrays). Suffice it to say that we had a problem with dust/dirt/sand/garbage getting into the troughs which would occasionally plug up the spray nozzles. Anyway, George rigged a filtering system for the pumps, using local materials (I think it was as series of burlap sacks). This photo could have been taken at any time from July to October 1979. He was my primary contact with Pemex, as I was the only Conair person who had basic knowledge of Spanish so I did the day-to-day liaison. If I recall his name correctly, this is Jaime Amesqua Keho, but my spelling of his name may be incorrect. He was a very competent P. Eng, and a pleasure to work with. He was also quite the student of philosophy and we had many fascinating conversations. I tried to track him down last year without success. Poza Rica, Veracruz. September 1979. Juan, the foreman of our 'gooper' crew. A true gentleman, one of those rare individuals you never forget. North of Veracruz, Veracruz. I think this was in September 1979 and we noticed we were being shadowed by the Mexican Navy. A Grumman HU-16 Albatross, I suppose. Reynosa, Tamaulipas - October 10, 1979. A Douglas DC-4 (note the round windows), leased in from Aero Union; also note how the titles are incomplete compared to T44 and T47 on the photo top of this page. "It was N67109, our tanker number 17, their number was 449; our two captain's names were Pat Ross and Jerry Sharpe. At Tampico and Vera Cruz. And they only leased one aircraft, though they had an option for another." (C-54P N67109 c/n 10459 suffered an accident on 30apr90 when the nosegear collapsed on landing at Chico,CA - fire rupted and the aircraft was damaged beyond economic repair; no fatalities - Webmaster). Note the #1 prop in fully feathered position. "This photo was most likely taken between September 25 and October 10, 1979, Tampico or Vera Cruz. We ran into the Aero Union guys a couple of times but my best guess is that this picture was taken in Tampico during the first week of October '79. I have a distant memory of talking to their SO (who I thought was a pretty cool and hard-working guy) - it may have been an oil pump failure or just a precautionary shutdown. Anyway, they were flying again the next day. It was a crazy period according to my logbook: we left Poza Rica September 26th, operated out of Reynosa for 2 days, then moved to Tampico on September 27th and did one trip locally. On the 28th we did 4 sorties out of Tampico, then returned to Poza Rica where we did another 3 local trips and subsequently tried to get some rest. On October 2nd, we went back to Tampico for a short visit, then got sent back to Reynosa on October 4th. We stayed there until October 10, which is when I made my cryptic logbook comment 'Fried #1'. On October 11th, Pemex flew us back to Poza Rica and on October 12th, we transferred to Tanker 444 and went back to Reynosa. It was a very chaotic time as I recall it. We had our share of 'technical' too. Sometimes when things go sideways the mechanical stuff doesn’t always work as intended. I remember 'Fried #1' and cranking the rudder trim to just shy of full stop and thinking what if we lose #2?. Shattered a piston on #1, couldn’t get a full feather, the fire extinguishers functioned successfully. All in a day's work." 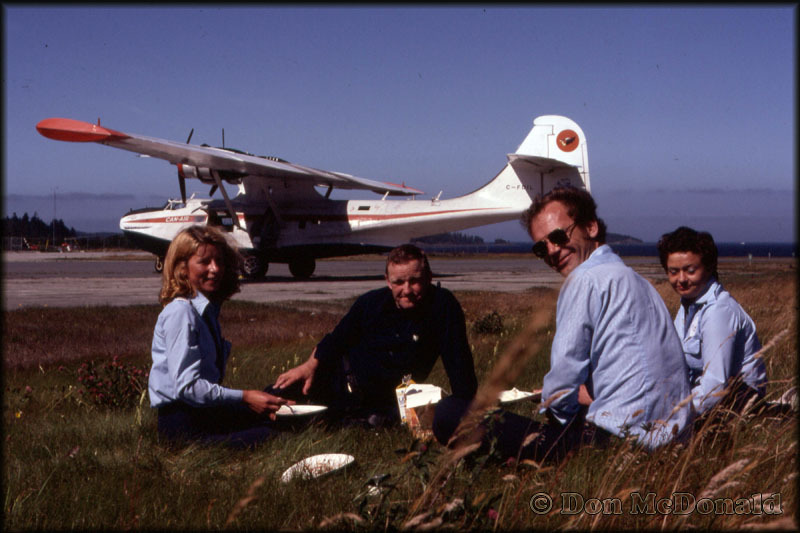 PBY Crew – lunch break at Port Hardy YZT, August 18, 1980. Left to right, Linda ? (flight attendant), Allan MacNutt (captain), John ? (ground agent), Gizella Barry (flight attendant). C-FDIL in the background. This aircraft C-FDIL is interesting in that it is one of the last surviving Royal Canadian Air Force Canso As (the Commonwealth name for the Catalina) built by Consolidated, rather than those under license from Canadian Vickers/Canadair. Don enjoying the view from the cockpit escapehatch; the titles on the nose read 'The Fishermens Special'. Vancouver-YVR, South Terminal, August 1980. Registered as CF-DIL by ? ?, Mar. 1946. Wheeler Airlines, St. Jovite Station, Quebec, 1965. Wheeler Northland Airways, St. Jean, Quebec, 1970. 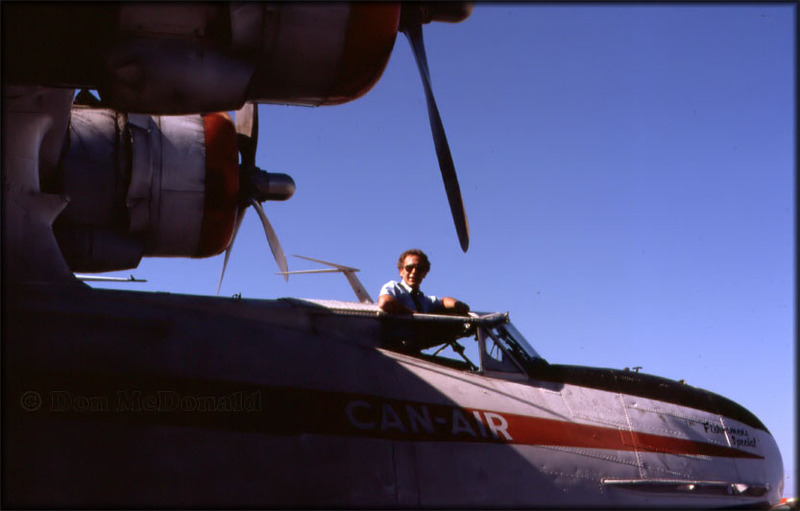 Ilford Riverton Airways, Winnipeg, Manitoba, 1972-1973. Can Air, Vancouver, BC, 1974-1981. - Flew as Fisherman's Special. Flying Fireman, Victoria, BC, 1983-1988. - Flew as tanker #5, later #775. Atwood Air Ltd, Victoria, BC, 1988-1989. 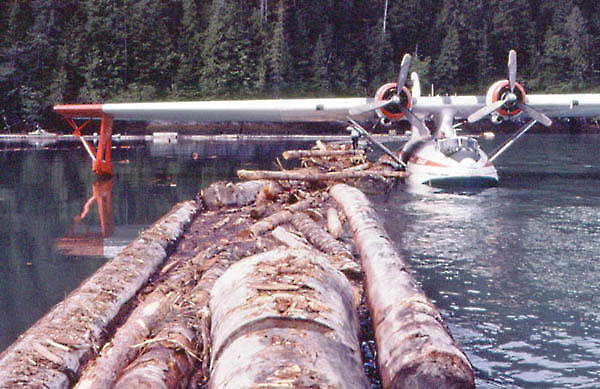 PBY at Hakai Passage – a long narrow channel between Calvert and Hecate islands, about 150 km north of Port Hardy. We were hauling freight and passengers supplying the ships one sees in the background. August 1980. 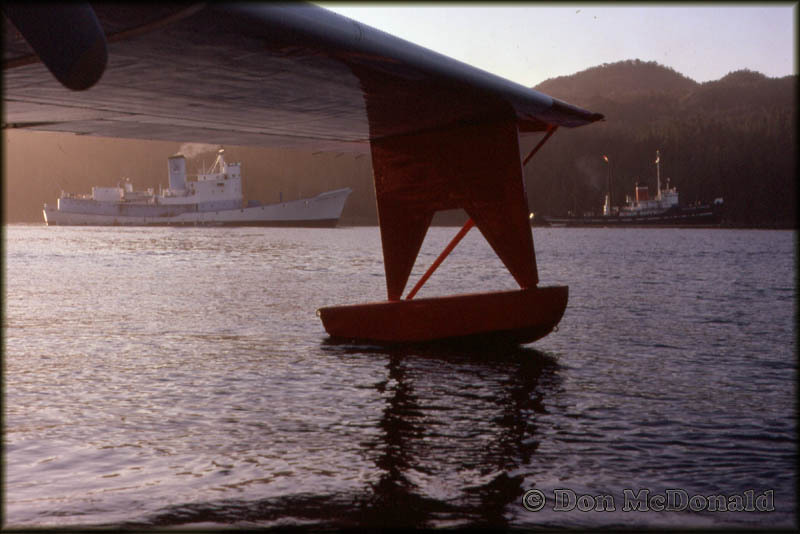 A picture of a Catalina PBY-5A in its element... Don McDonald sent me this shot of C-FDIL (c/n 427), made during the 1980s. "I was co-captain of this aircraft, tail number C-FDIL, which was operated by a company called Pacific Airboats and/or Can Air Services. 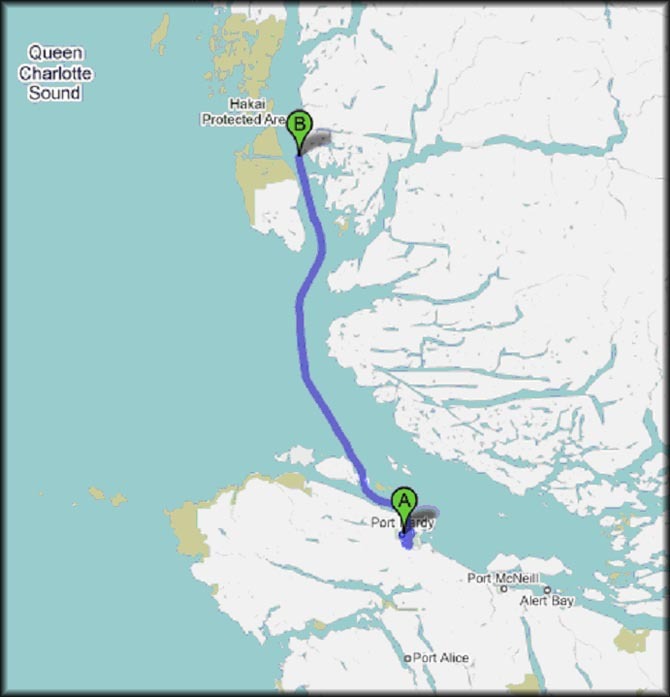 We flew the west coast of British Columbia between Vancouver and the Queen Charlotte Islands. The company only operated for a single season in 1980 and I subsequently ended up driving DC-3's in the western Arctic for Terra Mining and Exploration as well as for Buffalo Airways (world's largest fleet of radial-engine aircraft) and Northwest Territorial Airways in Hay River, NWT and Yellowknife, NWT. I've also flown water-bomber PBY's, water-bomber DC-6B's plus a host of light twins and single engine aircraft. I only spent five years as a commercial pilot before switching to the business world but somehow you never really leave it behind you....."